Predicting the future and managing risk with mathematics. The editors of the Jobs Rated Almanac compile statistics on 250 occupations and rank them based on six key criteria: environment, income, employment outlook, physical demands, security and stress. In the past six editions of the Jobs Rated Almanac, actuary has never been rated lower than fourth. Compensation depends on experience, employment location and the number of exams passed. A recent survey conducted by D.W. Simpson & Co. found that 80 percent of first-year actuaries with one SOA exam passed were compensated between $42,000 and $53,000 per year (excluding signing bonuses). 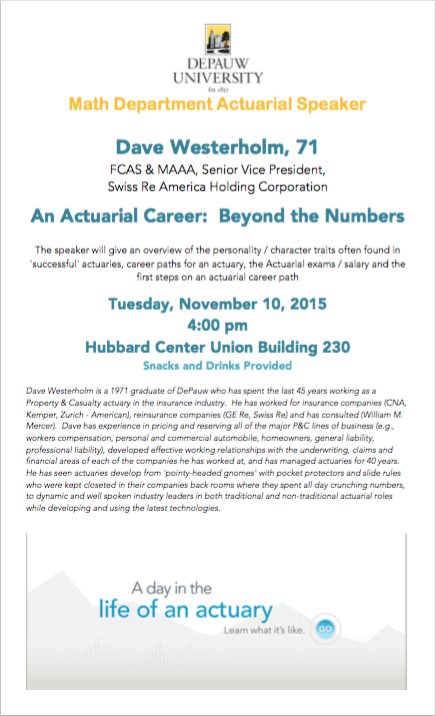 The salary growth potential for the actuarial profession is one of the highest available. For example, Fellows of the Society of Actuaries with 15 years of experience often earn in excess of $250,000 annually. For more detailed salary and compensation information, visit www.dwsimpson.com/salary.html. Actuaries apply mathematical principles and techniques to solve problems in finance, insurance and related fields. Actuaries are involved with every aspect of the insurance industry and must possess strong mathematical skills and a solid business background to apply their technical knowledge. Actuarial science is a collection of mathematical and statistical techniques that make it possible to calculate the monetary value of uncertain future events. For example, an insurance company that sells homeowner’s insurance must take into account how often houses burn down and what the replacement costs are when setting the insurance premium (yearly payment) for homeowners’ insurance. If the premium is set too low, then on average the company will not collect enough money in premiums to cover the replacement costs of the homes it insures. But if the premium is set too high, customers will choose other insurance companies which offer lower rates. How much money must be invested at the time of retirement in order to be able to make the pension payments until the employee’s death? It is not known how long the employee will live, so this must be answered after a careful statistical analysis. What percentage must be taken from the salary each month in order to have the required amount invested at the time of retirement? How should the money be invested in order to strike a balance between risky, high-return investments and reliable investments with lower return? In the United States, actuaries achieve professional status by passing a series of examinations administered by the Society of Actuaries (SOA) and the Casualty Actuarial Society (CAS). The first few exams are the same, but later exams differ between these two professional groups. Actuaries specializing in life insurance, health insurance, or retirement systems take the SOA exams. Those practicing in the property and casualty insurance area take the CAS exams. In each society, the designation of “associate” is awarded after approximately two-thirds of the exams are passed. Actuaries achieve “fellowship” standing after completing all exams. Fellowship in either society is the highest professional designation an actuary can attain. Undergraduate students generally pass several exams while in college if they want to be an actuary after graduation, at least passing one exam, thereby qualifying for attractive employment opportunities. Actuaries continue to take exams while working, eventually attaining professional designations such as Associate and Fellow (the highest designation). 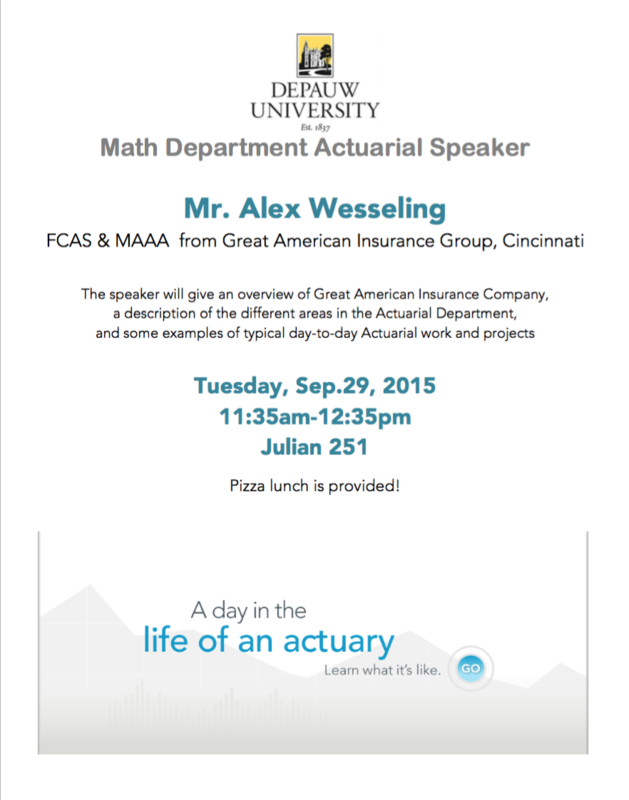 Detailed information can be found at the Society of Actuaries, Casualty Actuarial Society, and Be An Actuary. The seminar will include the topics of multivariate distributions, order statistics, the law of large numbers, basic insurance policies, frequency of loss, frequency distribution, severity, severity distribution, characteristics of an insurable risk, measurement of risk, economics risk, expected value of loss, loss distribution, premium payment, claim payment distribution, limits on policy benefit (deductible, maximum, benefit limits) and role of actuaries. After studying, students will be able to demonstrate a solid foundation in probability by their ability to solve a variety of basic and advanced actuarial practical problems. Prerequisite: MATH 441 which may be taken concurrently. This is a problem solving seminar that looks at the application of general derivatives, options, hedging and investment strategies, forwards and futures, and swaps. The context of these topics is actuarial science and financial mathematics. This course is of great assistance for students who are preparing for the actuarial exam (FM). Prerequisite: Math 331 which may be taken concurrently. All three VEE topics are required for both the ASA (Associate of the Society of Actuaries) and FSA (Fellow of the Society of Actuaries) designations. The CERA (Chattered Enterprise Risk Analyst) designation requires only the VEE Economics topic. More information and directories can be found on SOA Actuarial Training Programs. 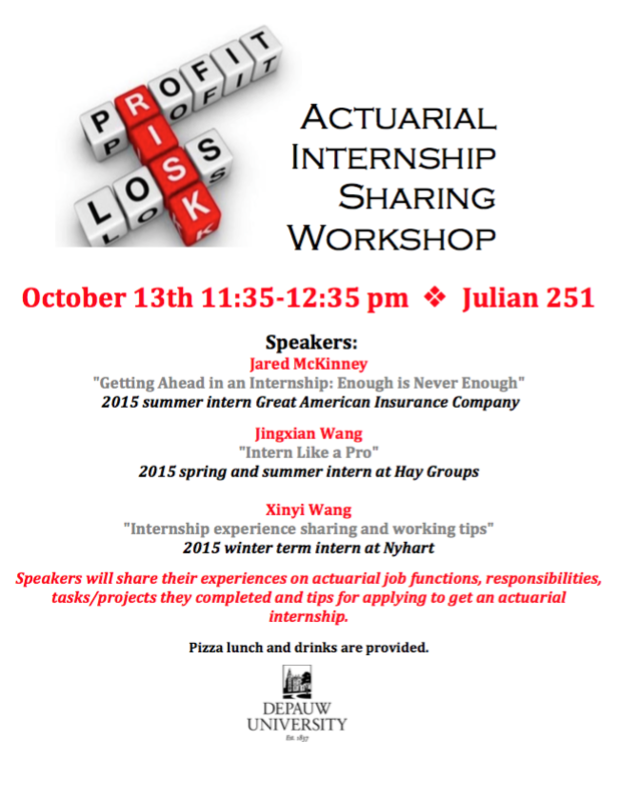 DePauw provides various resources to help our actuarial students to find internship and jobs. We invite actuaries from local insurance companies and actuarial consulting firms to campus visit and recruiting each semester. Please see our current and past event posters. Any questions you have related to Actuarial study, please feel free to contact Professor Zhixin Wu (zhixinwu@depauw.edu, Julian 310).